Set against the gorgeous backdrop of Rome, Tom Rachman’s wry, vibrant debut follows the topsy-turvy private lives of the reporters, editors, and executives of an international English language newspaper as they struggle to keep it—and themselves—afloat. Tom Rachman was born in London and raised in Vancouver. A graduate of the University of Toronto and the Columbia School of Journalism, he has been a foreign correspondent for the Associated Press, stationed in Rome. From 2006 to 2008, he worked as an editor at the" International Herald Tribune" in Paris. He lives in Rome. "This first novel by Tom Rachman, a London-born journalist who has lived and worked all over the world, is so good I had to read it twice simply to figure out how he pulled it off. I still haven't answered that question, nor do I know how someone so young ... could have acquired such a precocious grasp of human foibles. The novel is alternately hilarious and heart-wrenching." "[An] acute debut…[Rachman] paints the characters’ small dramas and private disappointments with humanity and humor." "Elegiac and bitter, funny and shocking. A group portrait of fascinating characters with nothing in common but their dedication to a doomed idea. I loved it." 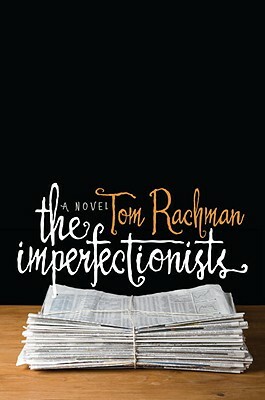 "Tom Rachman is absolutely a writer to watch, with the ingenious knack of getting under the skin of his characters. The Imperfectionists offers a witty, poignant glimpse into the universe of expatriates living in Rome, and the dreams, stress, and melodrama of a small newspaper. Rachman is clearly at home in these worlds, and his portrait is alternately hilarious, sad, intensely human, and always spot-on in its accuracy."